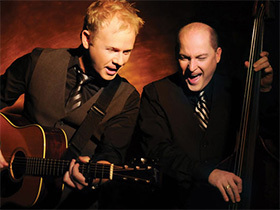 When “Dailey & Vincent” is in town, Branson becomes bluegrass heaven! This critically acclaimed duo has grabbed an unbelievable number of industry awards from the International Bluegrass Music Association and the Society for the Preservation of Bluegrass Music of America, as well as a Dove Award and Grammy nominations. Classic country, folk, gospel and, of course, superb bluegrass has captured this delightful duo numerous awards and nominations for everything, including Group of the Year, Male Vocalist of the Year, Entertainer of the Year, Song of the Year, Vocal Group of the Year, and the list of honors goes on. Their performance is so tight and brilliant, only siblings can pull it off...except, as their critically acclaimed album title says, they’re Brothers from Different Mothers! Jamie Dailey and Darrin Vincent have each worked with some huge acts, including Ricky Skaggs, Dolly Parton, Nora Jones, Emmylou Harris, and many others. “Dailey & Vincent” have created some amazing music, including their Songs of the Year, By the Mark and Do You Know You Are My Sunshine, their Gospel Recorded Performance of the Year, Don’t You Wanna Go to Heaven. Their album Dailey & Vincent Sing the Statler Brothers was awarded both Album of the Year and Bluegrass Album of the Year. And their music gets a big boost from their supporting cast of players and pickers, Jesse Baker, B.J. Cherryholmes, Christian Davis, and Jeff Parker.